A 65-year-old man died in a crash last Friday night when the semi-truck he was driving struck a barrier and went off a ramp over Highway 522. The truck’s cab detached from the trailer and fell onto the highway below, damaging five other vehicles and strewing debris across all northbound lanes of Highway 522. 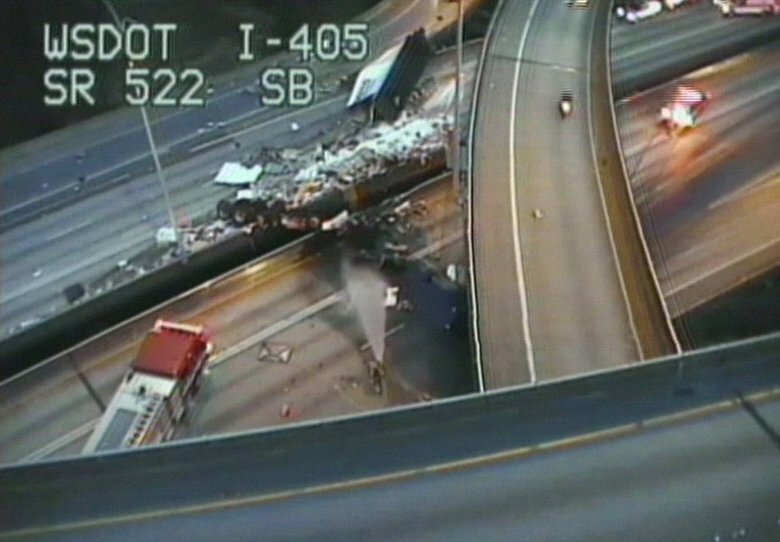 The Washington State Patrol is still investigating the cause of the accident. A driver was arrested after she apparently stole a truck, drove the wrong way on I-5, and crashed in Everett. The incident happened on Sunday morning; the suspect stole a truck in Granite Falls and was seen driving erratically before head headed southbound on northbound I-5. A dashcam video captured by a driver who witnessed the incident shows the truck speeding on the shoulder in the direction opposite traffic. The suspect then exited I-5 and crashed into two cars and a van before running off on foot. A K-9 unit tracked her down; she was taken to a local hospital before being booked into Snohomish County Jail. A rollover accident on Monday afternoon stalled traffic on the westbound lanes of the 526 Boeing freeway. Two cars collided; the driver of one was reported to have serious injuries. Traffic detectives responded to the scene to investigate the cause of the crash. A woman was injured after the bike she was riding was struck by another vehicle on Monday night. The crash occurred in the 1700 block of 12th Ave in Seattle. The bicyclist suffered an open fracture ankle injury and was transported to Harborview Medical Center for treatment. One 16-year-old boy died and five other people in the same vehicle were injured in a car accident after a Jeep Cherokee rolled over on Interstate 82 on Tuesday night. Three other teens and two men in their twenties were in the same vehicle and sustained injured; two were badly injured enough that emergency responders transported them to Harborview Medical Center. The Washington State Patrol is investigating the facts of the accident. They believe that the driver may have been intoxicated at the time of the crash. A pedestrian was struck and killed by a car on Wednesday night in Vancouver, Washington. According to the Washington State Patrol, a man was jogging in the right lane of I-5 northbound when he was struck by a vehicle in that lane. The jogger died at the scene. Investigators are looking into the facts of the accident and have not yet announced whether charges will be filed. One man is dead after the Harley Davidson motorcycle he was riding near Puyallup was struck by an unknown motorist. Police are searching for the driver of a white Ford pickup truck that ran through a light and crashed into the motorcycle, causing it to crash into an SUV. Witnesses at the scene said that the driver of the pickup truck didn’t even stop to check if the motorcyclist was injured before fleeing the scene. Troopers have asked anyone who might know more details about the crash to call the Washington State Patrol. One person died and two others were injured after a crash involving a Jeep Cherokee and three motorcycles on State Route 410 on Friday. The three motorcyclists were traveling in one direction when the Jeep crossed the center line and hit them. All three bikers were wearing helmets. One was pronounced dead at the scene, one was taken to Harborview Medical Center for treatment of injuries, and one was uninjured. The driver of the Jeep was also transported to Harborview. A three-car crash on Saturday near Chehalis, Washington killed two people and injured a third. One car was stopped for traffic on I-5 when a second vehicle slammed into its rear end; it was then pushed into the vehicle in front of it. The driver and the passenger in the first vehicle were life-flighted to a hospital; both passed away on Sunday. The driver of the second vehicle was transported to a local hospital. Police are still investigating the cause of the accident, but they do not believe drugs or alcohol were a factor. A bus accident on Saturday slowed traffic to a crawl on the West Seattle Bridge. A Metro bus and a car collided; one person in the car was injured, and no injuries were reported by the passengers on the bus. The bus involved was operating on route 21. A section of State Route 510 was closed on Saturday after a head-on crash involving two vehicles. A Ford Explorer traveling westbound drifted out of its lane while negotiating a left turn, striking a Nissan Sequoia traveling eastbound. Minor injuries were reported. The Washington State Patrol is investigating the accident, but no charges are currently pending.